World renowned trumpet and flugelhorn legend, Hugh Masekela returns with a fiery 44th album entitled ‘No Borders’. Encompassing socio-political commentary, solid dance floor grooves and tender love songs, the 16 tracks move effortlessly through continental styles taking in Nigerian Afro-Beat, Congolese Kwassa Kwassa and South African Masqandi. From the opening angry salvo of “Shuffle and Bow” which evokes the American South and old plantation songs, to the haunting collaboration with Oliver Mtukudzi, “Tapera”, Bra Hugh shows that he’s lost none of his fire. Recorded over a period of 9 months with producer Kunle Ayo, No Borders is a vibrant, bold and entertaining journey across various musical genres, featuring extraordinary collaborations. On the track “In an Age” Bra Hugh teams up for the first time with his US based son, Salema Masekela (AKA Alekesam), and the combination is thrilling. This song is also notable for Bra Hugh’s wild Zulu rap and was recorded in Los Angeles under the production guidance of Sunny Levine who also produced “One of These Days”. In another family connection, Sunny is the son of renowned producer, and Hugh’s long time friend and collaborator, Stewart Levine. No Borders also includes the popular feel good summer single “Heaven in You” featuring J Something of Mi Casa and other tracks feature notable guests such as legendary South African guitarist, Themba Mokoena and Congolese singer, Tresor. 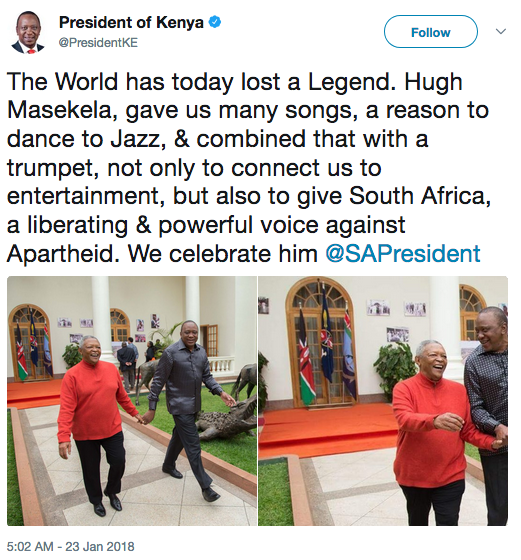 The album cover art shows a defiant Masekela showing off a pre-colonial map of Africa where no borders are represented, a state of affairs that is close to Bra Hugh’s heart. It is this theme that fuels the album’s pan-African feel, sound and vision. 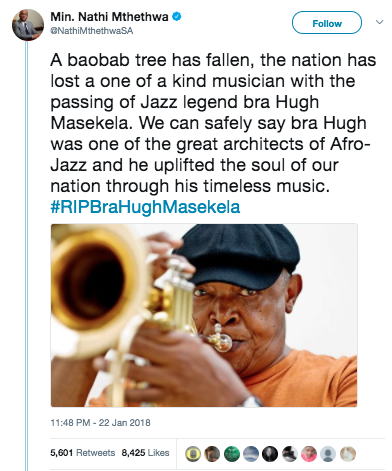 At the age of 77 Bra Hugh is still blowing strong. 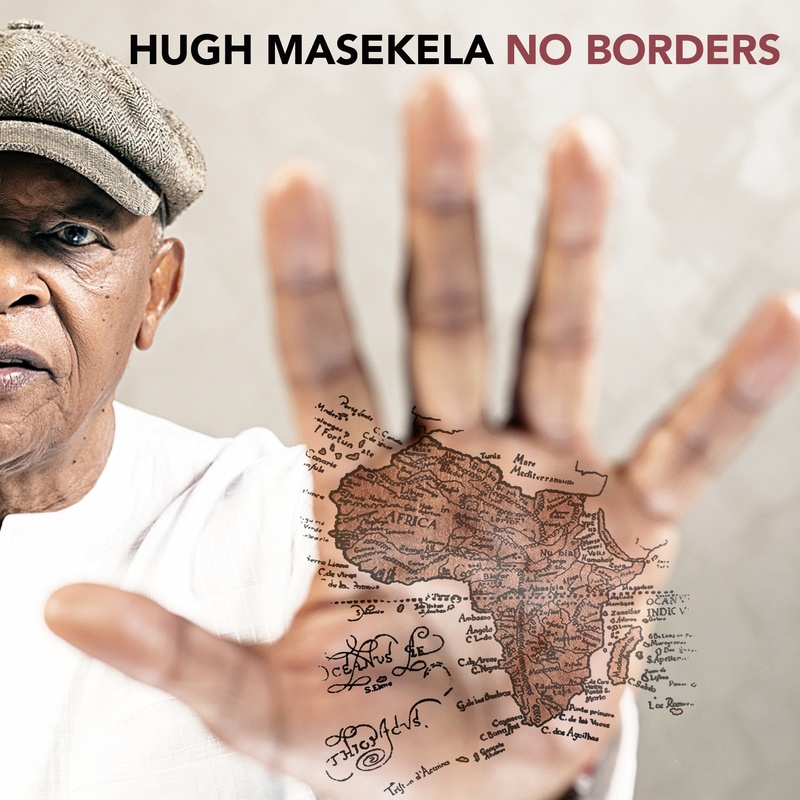 No Borders looks set to return Bra Hugh to the top of the international charts. Boss Selection is the California-based producer & songwriter Sunny Levine. Previous work with the likes of Pete Yorn, Scarlett Johansson, and Ariel Pink have cemented his reputation as a producer-to-watch. Levine is currently preparing the release of Volume One, a 13-track album that explores the different shades of Boss Selection’s soulful beatwork through multiple collaborations. For “One Of These Days,” Boss Selection enlists South African legend Hugh Masekela to lay down some warm vocals over a hypnotizing track built on piano and synthesizer flourishes. “Hugh is, and always has been, ‘Uncle Hugh’ to me—he and my dad have been friends since 1964,” Boss Selection explains over e-mail. Boss Selection’s Volume One, featuring collaborations with Rashida Jones, Brenda Russell, Orelia, Pete Yorn and more, will be out tomorrow. 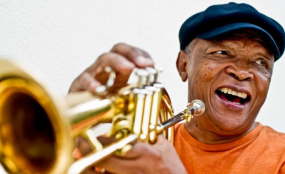 Oliver ‘Tuku’ Mtukudzi and Hugh Masekela, two giants of African music will join forces for a performance at the Cape Town International Jazz Festival taking place from March 27 to 28. The long-time friends who are bonded by their passion for heritage restoration in Africa and their love for traditional Southern African music will re-interpret some of their best-known songs at the sold out festival. Tuku, who will first perform in Bulawayo on March 20 before travelling to Cape Town the week after will join South Africa’s Donald, Ringo Madlingozi, Yvonne Chaka Chaka, Beatenberg, Madala Kunene, Mahotella Queens, Naima Kay, Sipho Mabuse, Banz Oester and the Rainmakers, Claude Cozens Trio, Courtney Pine (UK), Sons of Kemet (UK) and Dirty Loops (Sweden) among other groups. Affectionately referred to as “Africa’s Grandest Gathering” the Cape Town International Jazz Festival is the largest music event in sub-Saharan Africa, famous for delivering a star-studded line up. The festival which is held annually on the last weekend of March or the first weekend of April boasts five stages and over 40 artistes performing over two nights. The festival recognised as the fourth largest jazz festival in the world and the largest jazz festival on the African continent used to be called the Cape Town North Sea Jazz Festival due to its association with the North Sea Festival in the Netherlands. It has grown since it first started in 2000, and as a result, attendance has also grown from 14, 000 concert goers in 2000 to 40,000 concert goers last year. The ghost of that word—its history, injustices and the need, for some, to move beyond it—is ubiquitous in the music of South Africa, a nation for whom music and politics are inextricably linked. This year, the 20th anniversary of South African democracy’s beginning and apartheid’s end, Carnegie Hall wrestles with that legacy in an ambitious, month-long festival dedicated to the music and culture of South Africa. The programming ranges from jazz and classical to traditional and pop, and includes both South African stars—the male choral group Ladysmith Black Mambazo and jazz greats Hugh Masekela and Abdullah Ibrahim —and music rarely heard in the U.S., like that from the Cape Malay community, based in Cape Town. Paul Simon and Dave Matthews, who was born in South Africa, will also make appearances. The festival, whose events take place at Carnegie and partner organizations including the Paley Center and Schomburg Center for Research in Black Culture, begins Wednesday and runs through Nov. 5. Geographically themed festivals have been a Carnegie mainstay since 2007; recent festivals have been dedicated to Latin America and Vienna. Africa, however, “had been conspicuously absent from the festival map,” Carnegie’s director of artistic planning, Jeremy Geffen, said in his office, which houses a menagerie of beaded South African figurines. But concert curating, unlike democracy, must leave out somebody. Much of what Carnegie Hall has shaped revolves around the voice, to which Mr. Geffen said South Africans are uniquely attached. Two classical sopranos, Pretty Yende and Elza van den Heever, make their New York recital debuts. In addition to traditional Western fare, Ms. van den Heever will sing art songs by South African composers, in Afrikaans. Programming at other venues includes art by William Kentridge and a concert of current South African pop stars at the Apollo Theater. The festival is unusual for bringing a broad swath of South African music onto one of the world’s most hallowed stages, and commendable for going beyond black and white and including the mixed-race choirs of the Cape Malay community, said Carol Muller, a University of Pennsylvania ethnomusicologist who was born in South Africa. Ms. Kidjo’s concert pays tribute to the South African singer Miriam Makeba, a civil-rights activist and Ms. Kidjo’s personal mentor, credited with spreading African music internationally. 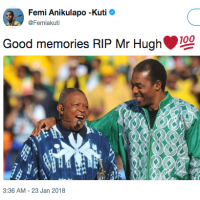 Oliver “Tuku” Mtukudzi was full of praise for South African counterpart and music legend Hugh “Bra Hugh” Masekela, saying the trumpeter was proud of his African identity. 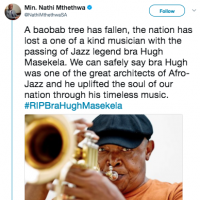 In his inaugural lecture held on Tuesday at the University of Johannesburg during the Annual Hugh Masekela Lecture, the Zimbabwean music icon hailed Bra Hugh for staying true to his African roots. The prepared lecture was availed to The Herald Entertainment yesterday. “As I was preparing this lecture, looking at Hugh’s life – the challenges, the failures and the successes – I realised something. “At this time in history, when we as Africans are being challenged in so many ways as we try to strike a balance between taking up more and more of Western culture versus holding on to the things that give us our identity; our languages, our values, our music, our dances, our way of dealing with conflict, our sisterhood and our brotherhood; we need people who can remind us what it is to struggle, to fight, and to win in the end – and do so without giving up our identity as Africans,” Mtukudzi said. Delivering a paper titled “How do you measure the impact of a man?” Mtukudzi or simply Tuku to his fans, said Bra Hugh’s worth could not be measured according to accolades, fame or fortune but his humanity. “Each time I meet Hugh, his music, his status as a legend and his accolades, have grown. But he as a person, his humanity, what we call in Shona “unhu” or as you would say here “ubuntu bakhe” – remains the same. “If you approach him as a celebrity, yes you get the celebrity, the man who is trying to deal with a fan – but I have seen over and over again the magic that happens when people approach him as another human being. “He responds to them like a father, like a brother; with humility, with warmth – except if you’re wearing a weave. As we all know Bra Hugh does not like weaves,” he jokingly said. Tuku, however, said that it was important to ask “what has my real contribution been?” and “how will my life be measured?” for people to measure the impact of a man or woman. “You measure someone not by how much they have done, or how many awards they have received, or how many degrees they have. “Instead, you measure people by what they overcame to achieve those things, because that tells you the story of their strength of character. Or to put it differently, whether they are of sterner stuff or not. “At a time when we see so much moral bankruptcy, where our continent cries out for answers and solutions, we need more than ever before men and women of character. “As we fight to hold on to our heritage and to our continental dreams and the key ingredients that unite and identify us as Africans, we need men and women of character,” Tuku said. Tuku first met Hugh Masekela in 1983 in Bulawayo. By that time, Tuku was already a professional musician. 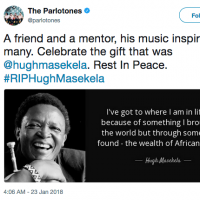 Tuku had been following Bra Hugh’s work as well as respected his talent. The two would exchange notes and then moved on with their lives. 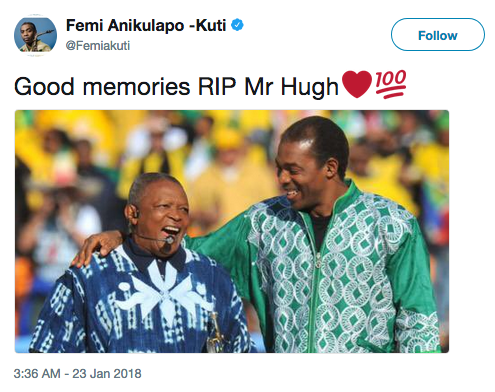 It was only three years later that Tuku began to grasp some key aspects of Bra Hugh’s character. “I was performing at a club called Job’s Night Spot in Harare. Bra Hugh was in the audience, and from nowhere he jumped up on stage and joined me and my band. His energy, his laughter, his aura, his naughty smile were all so infectious. “Our friendship has developed very steadily over the years and we have become serious fans of each other’s work. 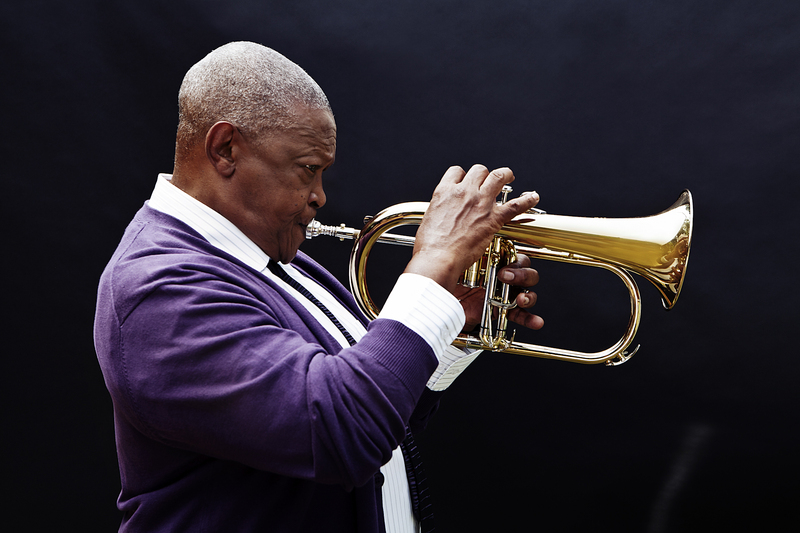 Hugh Masekela will celebrate his 75th birthday on April 4th in New York City with a concert performance at Lincoln Center for their Jazz At Lincoln Center series, with featured guests Paul Simon and Sibongile Khumalo. 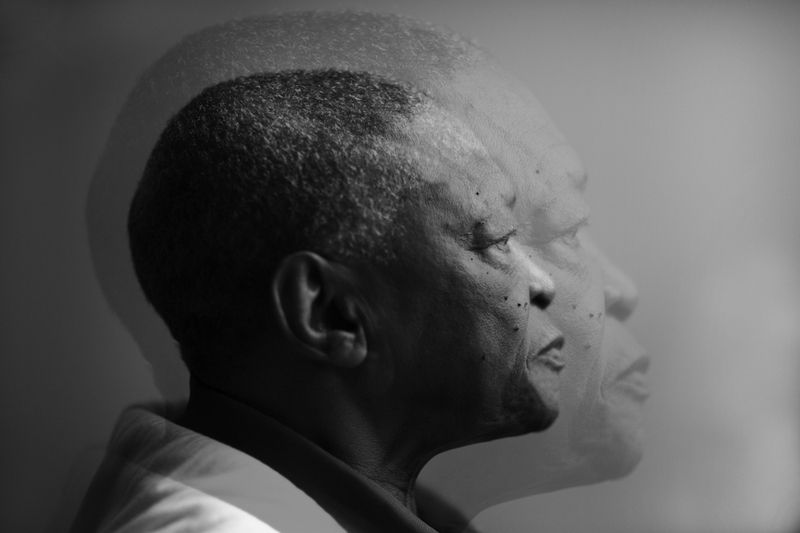 In addition the ageless Masekela will be releasing his latest music video, “It’s All Over Now, Baby Blue”. Taken from latest album “Playing At Work”. The video is a unique township mbaqanga take on the Bob Dylan classic. It is also a moving tribute to Bra Hugh’s lifetime friend, and legendary South African photographer Alf Kumalo. The video features never-before-seen footage of Bra Alf Kumalo, at work in his darkroom and shooting street scenes in Alexandra Township. The video also includes an incredible montage of some of Bra Alf’s most iconic pictures spanning the last 50 years of world and South African history – a dizzying array of images that capture some of the most important moments and icons in our country, and the world’s, history. As well as striking photographs of the ordinary men and women who crossed Bra Alf’s path. Nelson Mandela, Archbishop Desmond Tutu, Oliver Tambo, Robert Sobukwe, Steve Biko, Ruth First, Winnie Madikizela-Mandela, Father Trevor Hudddleston, Miriam Makeba, and Muhammad Ali are all featured in private and public moments, at ease in the eye of Bra Alf’s lens. The most telling part of the music video is a picture of a young 16-year old Hugh Masekela leaping in the air, clutching the trumpet that had been sent to him by Louis Armstrong. This iconic image became the starting point of a life-long friendship between the two young men, both of whom went on to change the world in their respective ways. The video was directed by Brett Rubin alongside cinematographer Robert Wilson, art director Nicole Van Heerden and editor Tom Glenn. The video was produced by House of Masekela in association with Vatic, and is endorsed by the family and estate of Alf Kumalo. Drum magazine was founded through the genius of Jim Bailey, an extremely non-conformist and unconventional young white entrepreneur who had identified a colossal void in South Africa’s publishing industry. Bailey realized that there was a growing urban African township generation which had begun to celebrate music, glamour, cinema, fashion and sports; an indigenous population that was deep into political resistance, ethnic pride, upward mobility and the scandal and gossip that comes with it. Hugh Masekela has teamed up with a bevy of young Scandinavian girls, the Baobab Singers, to produce an album of African folk songs that will be released next year. The Danish group has been charming local township dwellers over the past few weeks by breaking into traditional folk songs in Sotho, Zulu, Xhosa and Tswana on street corners, wowing pedestrians with soulful renderings of songs they recognise. A favourite of Desmond Tutu, the group of Danish singers performed at his 80th birthday party a few years ago and at his wife Leah’s 80th birthday this year. 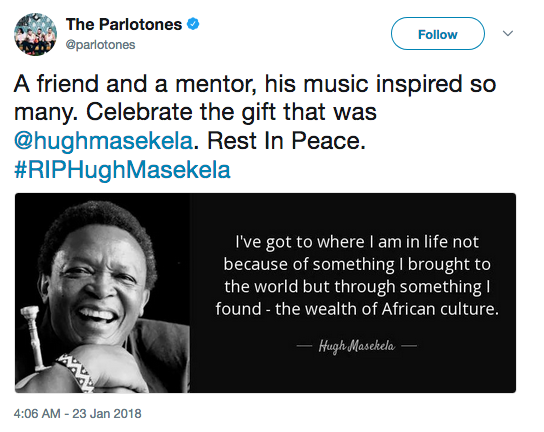 When Bra Hugh received an e-mail from Forchhammer suggesting a collaboration, he believed it was fate. The musicians have spent the past few weeks recording an album – not yet named – of 12 tracks, mostly South African traditional songs with some Danish and Norwegian folk songs too. The songs are arranged by Bra Hugh. ”With this album we are trying to combine the texture and soul of South African music with Danish music,” says Forchhammer. Johannesburg came alive on Saturday evening when jazz greats took to the stage for “South Meets South — An Evening With The Masters”. The feelings of familiarity rose from the soft cries of Hugh Masekela’s flugelhorn and the timeous notes from Larry Willis’s piano playing. This familiarity is undoubtedly owed to their long friendship and musical chemistry evinced on stage at the Johannesburg Arts Alive International Festival’s show at Mary Fitzgerald Square in Newtown, on Saturday. As the two played classic jazz standards into the night, Masekela’s poor boy hat, wide tie and waistcoat, and Willis’s retro grey suit and eyewear added even more nostalgia to their show. With bellows so heavy, Masekela’s knees buckled trying to carry the cries of his voice and horn while the crowd’s enthusiasm buoyed his sound. This was matched as Willis—a native New Yorker who has played alongside jazz legends such as saxophonist Jackie McLean and vocalist Carmen McRae—did more than just carry the melody. Despite the venue’s cavernous feel that hardly provided the intimate setting this type of show deserved, the two musicians somehow managed to maintain a connection between them and the crowd. Greeting the sea of diverse faces in the sparsely lit oversized tent, Masekela prepared the audience for a set featuring a “kaleidoscope of music” that influenced him and Willis throughout their 53-year-long friendship. With each song that followed came a comical or emotionally stirring anecdote told in the charismatic way the legendary South African musician has become famous for. From stories of Masekela and Lewis’s time spent at New York’s Manhattan School of Music in the 1960s, to being introduced to each other and eventually starting a band—the award-winning trumpeter, flugelhornist and singer proudly spoke of their musical journey together. And with this long list of revered jazz greats he spoke of, Willis and Masekela played songs such as Easy Living by Billie Holiday and Clifford Brown, Fats Waller’s Until the Real Thing Comes Along and Billy’s Bounce by Charlie Parker. 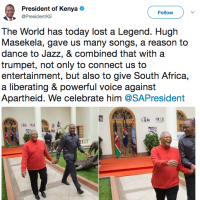 Echoing what he said at TEDxObserver event in March last year—”Heritage is something that is beneficial to a society”—Masekela enthralled the audience with songs from his home country. 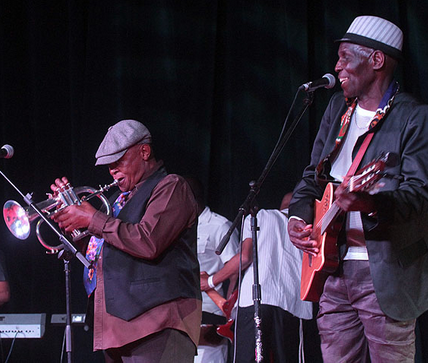 Masekela was joined on stage by singer Pu2ma, the harmonising brothers from Vosloorus, in Ekurhuleni, called Complete—who provide backing vocals—and keyboardist Randall Skippers. They performed a few South African tracks such as Holilili and Abangoma, taught to Masekela by the late Miriam Makeba, who he said was “a stickler for tradition”. Living up to the event’s “South Meets South” title, which is part of the “Ten Days in September” theme as the festival takes place over 10 days across different venues in Jo’burg, the show featured acts from South India and Brazil, representing the Latin American south. The involvement of these countries at the event also forms part of the festival’s tribute to the inclusion of South Africa in the Brics (Brazil, Russia, India, China and South Africa) group. Opening the event was India’s acclaimed classical violinist Dr L Subramaniam and his band, who took to the stage for an hour of Carnatic sounds. Leaving the crowd spellbound with his virtuoso technique, Subramaniam’s sounds reached a peak of frenetic yet melodic sounds that set the mood for the night. 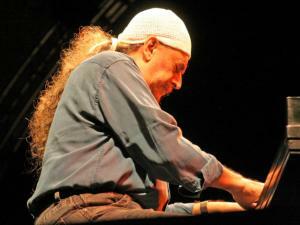 Following Subramaniam, was one of Brazil’s most skilled instrumentalists Egberto Gismonti. Showing off his background in classical piano before moving on to playing the 10- and 12-string guitar, Gismonti kicked off his set on the piano with a deep and dramatic rendition of Robert Schumann’s Kinderszenen opus 15 number 7 Träumerei. Gismonti later admitted that a technical glitch with his guitar meant he couldn’t play it as he had planned to. When he was finally handed the 12-string instrument, Gismonti warmed and smoothed his set out as he played only one song before expressing dissatisfation over the sound of the guitar and the lack of silence in the tent. “This guitar is almost broken. It needs a certain silence,” he said before playing what he called a “Norwegian flute”—known as a seljefloyte or an overtone flute. Before wrapping up the cool spring night, Willis and Masekela came full circle as they made newtown indeed a space for south and south to connect when they played When It’s Sleepy Time Down South, made famous by trumpeter Louis Armstrong. High-brow jazz forms a major part of the annual Arts Alive this year. It will be one of the rare occasions when South Africans will be able to see Hugh Masekela play classical jazz. He will be joined by life-long friend and jazz pianist extraordinaire Larry Willis. Their performance forms part of the South Meets South – An Evening with the Masters performance. India’s violin icon, Dr L Subramaniam and Egberto Gismonto from Brazil complete the line-up. The concert is taking place at the Bassline on September 7. Bassline’s Brad Holmes conceptualised the show and is very excited about what will transpire on the night. It is also in keeping with South Africa’s inclusion in the Brazil, Russian, India, China and South Africa group with cultural items from Brazil, India, and China featuring strongly in the content across artistic genres. Looking at his vast repertoire, it is doubtful the man sleeps. He has recorded more than 60 albums, 27 scores for ballets, 28 film scores, 13 TV series and 11 theatre productions. 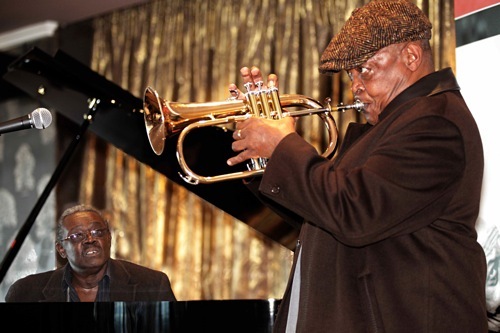 Bra Hugh and Willis have known each other for 60 years and tour the US as a duet. They met at the Manhattan School of Music as students. Willis has played on more that 300 albums and recorded with greats such as Dizzy Gillespie, Art Blakey and Shirley Horn. Pu2ma will provide the vocals to their performance. Dr Subramaniam composed for film productions such as Bernardo Bertolucci’s Little Buddha and Mira Nair’s Salaam Bombay and Missisippi Masala. He has more than 150 releases and has collaborated with artists such as Herbie Hancock, Al Jarreau and Joe Sample. South Meets South will take place at Mary Fitzgerald Square under a dome. Tickets are available from Computicket. The Johannesburg Arts Alive festival starts on Sunday with Jazz on the Lake. This annual free festival boasts a strong line-up yet again. Mafikizolo is a must-see, particularly after their latest release and massive success of their songs Khona and Happiness. The mbaqanga legend, Phuzekhemisi, makes a rare appearance at this end of the country and is also a great live experience. Brenda Mntambo has been making waves in and outside of gospel. There’s also a special treat for jazz heads in the Satchmo Trumpet Summit (from the US), while the Sufi Gospel Project from India promises to spice things up. Please be aware that there will be road closures from 9am. eTuk Tuks are available for the first time, and there is a park and ride from the Metro Building in Braamfontein and the Alexandra football stadium.